Shortly after Hafiz Saeed’s release, he said he would mobilise people for the “cause of Kashmir". 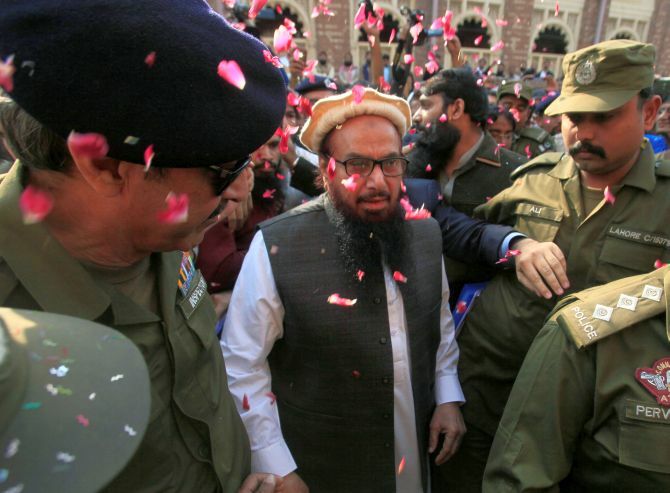 Pakistan on Friday freed Hafiz Saeed, the chief of the banned Jamaat-ud-Dawa and mastermind of the 2008 Mumbai terror attack from detention, who immediately launched his anti-India rhetoric by saying he would mobilise people for the “cause of Kashmir”. The Jamaat-ud-Dawah head, who carries a $10 million (Rs 64.6 crore) bounty for his role in terror activities, was released after the government decided against detaining him further in any other case. He was under detention since January this year. The fire-brand cleric’s release after midnight came ahead of the 9th anniversary of the 26/11 Mumbai attacks in which 166 people were killed. India has repeatedly asked Pakistan to re-investigate the Mumbai terror attack case and also demanded trial of Saeed and Lashkar-e-Tayiba operations commander Zakiur Rehman Lakhvi in the light of evidence it had provided to Islamabad. Saeed, addressing his supporters gathered outside his residence said: “I was detained for 10 months only to stop my voice for Kashmir. “I fight for the case of Kashmiris. I will gather the people from across the country for the cause of Kashmir and we will try to help Kashmiris get their destination of freedom”. Punjab province’s Judicial Review Board comprising judges of the Lahore high court on Wednesday unanimously ordered Saeed’s release on the completion of his 30-day house arrest which expired on Thursday night. The ministry of external affairs said Saeed’s release confirmed once again the lack of seriousness by the Pakistan government in bringing to justice perpetrators of terrorism, including individuals and entities designated by the UN. “It also appears to be an attempt by the Pakistani system to mainstream proscribed terrorists. Pakistan has not changed its policy of shielding and supporting non-state actors and its true face is visible for all to see,” MEA spokesperson Raveesh Kumar said in New Delhi on Thursday. Saeed said that he was detained when he announced a month of solidarity for Kashmiris in January. 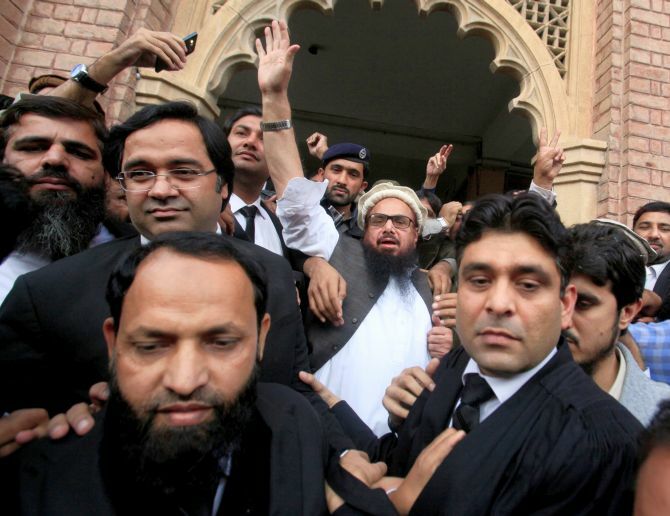 Using the release order to buttress his claim of “innocence”, Saeed said: “I am very happy that none of the allegations against me proved as three judges of the LHC ordered my release... India had levelled baseless allegations against me. The LHC’s review board decision has proved that I am innocent”. “I was detained on the pressure of the United States on the Pakistani government. The US did so on the request of India,” he claimed. Several JuD supporters, gathered outside Saeed’s house in Lahore’s Jauhar town to celebrate his release, shouted anti-India slogans. “We are happy to see our leader free,” JuD spokesman Ahmad Nadim said. “Saeed has been freed as the Punjab government decided not to detain him further in any other case,” a top government official said. He said that after a long deliberation, it has been decided to follow the review board’s decision. Saeed’s release would lead to strong criticism from India and the US, official sources said. “It remains to be seen as how would the Pakistan Muslim League-Nawaz government handle the foreign pressure to again detain Saeed,” they said. Punjab Assistant Advocate General Sattar Sahil said the government law officer had presented “some important evidence” to justify Saeed’s detention, but all three members of the board unanimously rejected it and ordered his release. On January 31, Saeed and his four aides Abdullah Ubaid, Malik Zafar Iqbal, Abdul Rehman Abid and Qazi Kashif Hussain were detained by the Punjab government for 90 days under the Anti-Terrorism Act 1997 and the Fourth Schedule of Anti-Terrorism Act 1997. The last two extensions were made on the ‘public safety law’. The board refused to give a further extension to the detention of Saeed’s aides. They were set free last month. According to the rules, the government could detain a person for up to three months under different charges, but for extension, it needs approval from a judicial review board. The JuD is believed to be the front organisation for the banned Lashkar-e-Tayiba which is responsible for carrying out the Mumbai terror attack in 2008 in which 166 people, including six Americans, were killed. Saeed was put under house arrest after the Mumbai attack in November 2008 but he was freed by a court in 2009. Ten LeT militants had killed 166 people and wounded dozens in Mumbai in November, 2008. Nine of the attackers were killed by police while lone survivor Ajmal Kasab was caught and executed after a court found him guilty. Saeed was declared a global terrorist by the US and the UN after the Mumbai attack. What if India 'takes out' Hafiz Saeed, Dawood? Will Pakistan ever hand over Hafiz Saeed? BAH!